The M-6 Portable mosquito traps from Enviro Bug Control can be used both in and outdoors and combine several methods of attractions for mosquitoes and house flies. A special UV light, heat, attractant and co2 lures flying insects into the trap where a powerful noiseless fan will then draw them into an internal trap to either dehydrate or be released outdoors. 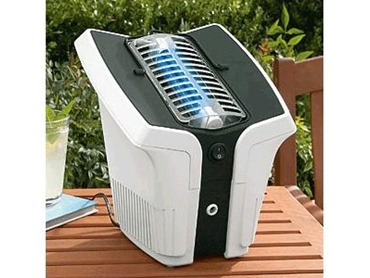 Milk, meat, beer, decayed apple, lactic acid, yeast fermentation and other foods can be added to the attractant compartment so when the M-6 works it releases an odor with the fan which can lure some genera of mosquitoes. The unit will however work efficiently without the attractant which makes it an additional feature rather than a required one.